Content creation is one of your best tools in marketing. Original, eye-catching content can give your site a boost and drive business to your company. In fact, content is the single most important factor in both driving business to your website and keeping customers interested once they arrive. Content also affects your Google rankings and those of other search engines. Original, quality content brings your rankings up; copied, stale content drives them down. Obviously, content is important. However, many business owners are stymied when it comes to creating content that others will want to read. Because content can seem so overwhelming, many business owners take the attitude that “getting something up” on the website is the best they can do and convince themselves this will be enough. Remember—having a website is a means to an end, not an end in itself. If you are going to invest your time and resources in having a website, be sure to do it right with valuable content. 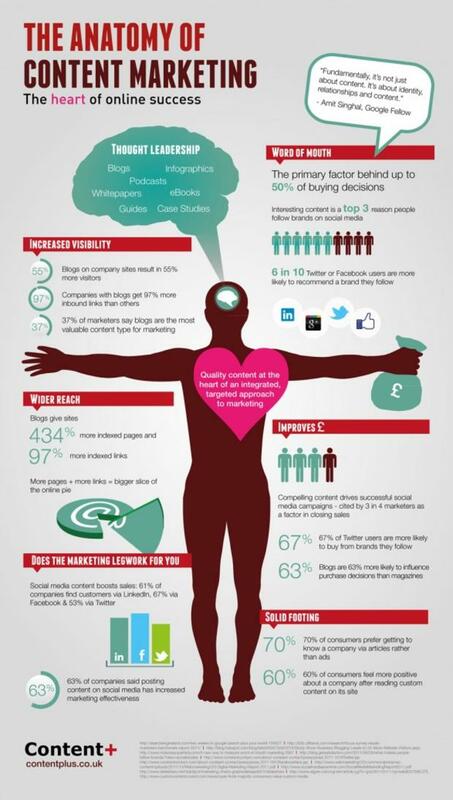 This infographic shows the basic components of content marketing and gives you an idea of just how effective this strategy can be when used properly. Thought leadership. Content consists of many things: blog posts, white papers, ebooks, podcasts and other items. Choosing the right type of content is the first important decision you must make. The type of content your readers want depends on your target audience. Word of mouth drives 50 percent of buying decisions. The way to get people talking about your website is to create original, inviting and interesting content. This has an exponential effect on your website’s popularity as more and more people tell others about your great site. Increased visibility. Blogs increase visitor traffic by an average of 55 percent. Websites with blogs also garner 97 percent more inbound traffic and 37 percent of experts agree that blogs are the most valuable type of content marketing. Improved sales. Marketers agree that good content drives sales. 67 percent of Twitter users buy from brands they know and blogs are 63 percent more likely to drive sales decisions than other written media. Social media marketing. 63 percent of companies agree that social media use has increased their overall sales figures. Solid footing. 70 percent of customers are more likely to remember and buy a brand about which they have read an article than those which they have been exposed to only by ads. 60 percent of customers state that they feel more comfortable with a company after reading about it in a blog or in marketing content, and they have more positive feelings toward the brand. It is clear that content is very important in your overall marketing strategy, so taking the time to write original content is an investment that pays off. Orange County SEO can help you create original, valuable content for your website that will give your business the website traffic you want. Contact us today to find out how we can help you with good content marketing strategies.